Courtesy of work, I recently had the opportunity to travel to Bali, Indonesia. An Island that just falls outside the world’s top 100 smallest islands by area, yet Bali manages to squeeze in over four million people (and way too many motor bikes). Tourism is by far the single largest industry, around 80% of Bali’s economy is tourism related. As a result, there are plenty of accommodation options. A quick look on Tripadvisor shows no less than 114 five star hotels & resorts. Opened in 1993, The Intercontinenal Bali Resort is one of the more established luxury resorts. 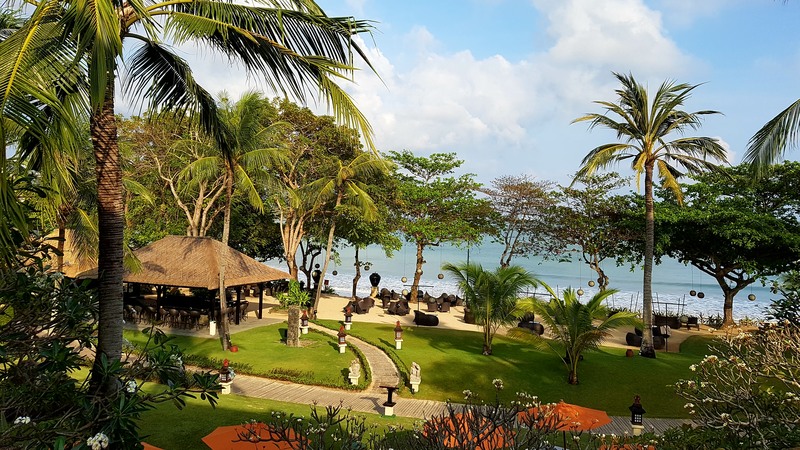 Stretching across white sand beachfront overlooking Jimbaran Bay, it is located just 8km away from the Ngurah Rai (aka Denpasar) International Airport. Though with Bali traffic, 8km is more like an hour in the car. Influenced heavily by Hindu philosophy, the hotel features 417 guest rooms and suites designed to blend traditional Balinese architecture and modern conveniences. The Resort adheres to the principle of tri hita karanaepitomizing the balance and harmony between the three sources of life: humans, nature and God. The resort’s architecture also honors the sacred axis between the holy mountain and the sea. Balinese style and heritage continue inside the spacious 49 sqm Resort Classic Room featuring detailed timber furnishings and art. Each room enjoys a private balcony overlooking the gardens, pools and lagoons, and a marble bathroom with separate bathtub and rain shower. There are four onsite restaurants serving from Indonesian, Italian, and Japanese cuisines, to bar and grill. Each offering a different ambiance to fit the occasion, or the resort will happily arrange a private dining experience. If none of the onsite options take your fancy, there are a good selection of restaurants within five to 20 minutes walk around the Resort. What better way to find your inner balance and rejuvenate than some pampering at Spa Uluwata. The spa and sauna is complimentary for guests, but for more serious relaxation, try the traditional Balinese massage or the warm stone massage. Spa Uluwata does get pretty busy, and it’s only open till 10pm, so be sure to book in early to avoid missing out. Even at capacity, there’d be plenty of space for everyone to spread around. There’s not one, two or three pools, but six in total! Don’t forget the white sandy beach too. “Tranquil” is probably a pretty good description of the Resort. Planet Trekkers is a kids haven that opens from 9am to 10pm daily, giving parents a chance to really relax. Supervised activities are run throughout the day, and meals are included. The fitness centre is open 24/7, which is a real convenience after a day of food indulgences. If you choose to stay connected, WiFi coverage at the Resort is fantastic. Intercontinental Bali Resort is certainly not a bad choice for a resort style holiday particularly when you take into account the relatively cheap flights available from Australia. If you’re looking for something similar but less crowded, check out Langkawi or Kota Kinabalu, Malaysia. In fact, there are certainly resemblances between the Intercontinental Bali Resort and The Andaman, Langkawi. By the way if you have a spare AU$431 million, the Intercontinental Bali Resort is on the market for sale at the moment!